Here are a few points that we would like to let our parents here at Lakewood know about our P.E. program. All children have P.E. every day of the week for 30 minutes. We need all students to wear tennis shoes along with comfortable clothing for the weather that day. (They need to lace or velcro close, no slip on shoes. They must cover the toe and the heal with rubber soles. They should not have a heal on them.) We have an activity room that we use only on rain days. Students will lose two points for everyday they don't wear tennis shoes. This can also hurt them in the Golden Shoe contest between classes. Students can also lose up to five points for their behavior each day. Students will be tested twice a year on the Alabama Physical Fitness Test. Friday Free Play is a weekly event on Friday that students get a chance to try different activities on their own. On Friday students may purchase drinks for a $1.00. Along with Friday Free Play we have Wheels Day each week. For Wheels Day students may bring scooters, roller blades, skates or skate boards. All equipment must be able to fit into a bag like a laundry or bat bag that the child can carry. With the use of any wheels at school students must wear a helmet. If you require the use on any other equipment at home please send it with them. Students in 3rd - 5th grade who make it to the top of our no-knot rope will have the opportunity to go on a field trip to the Rock Climbing School in Columbus,Ga. 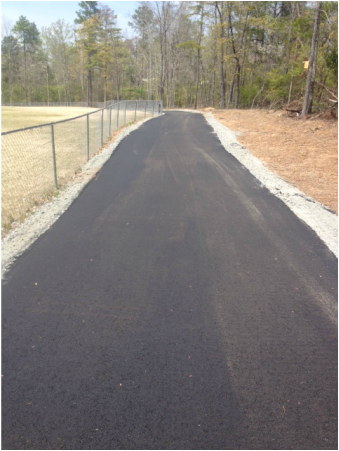 Our PE Deparment is overjoyed about their newest addition - a paved running track! The coaches have worked hard and creatively hosted fundraisers in effort to see their dream come true. 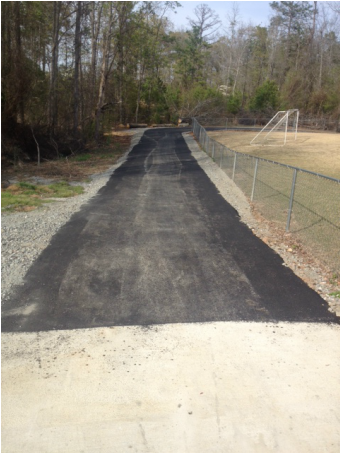 LES strives to have an authentic PE program and this is one way to encourage life-long runners!